It is pretty simple logic. Without any research and development, there is no innovation. And as many know, Samsung has been one of the most aggressive R&D spenders in the world. According to Strategy& (formerly known as Booz & Company), Samsung has been named as the No.1 R&D spender among global IT companies and No.2 overall in 2014. This reaffirms Samsung’s commitment to R&D and bringing innovative lifestyle products to its customers. 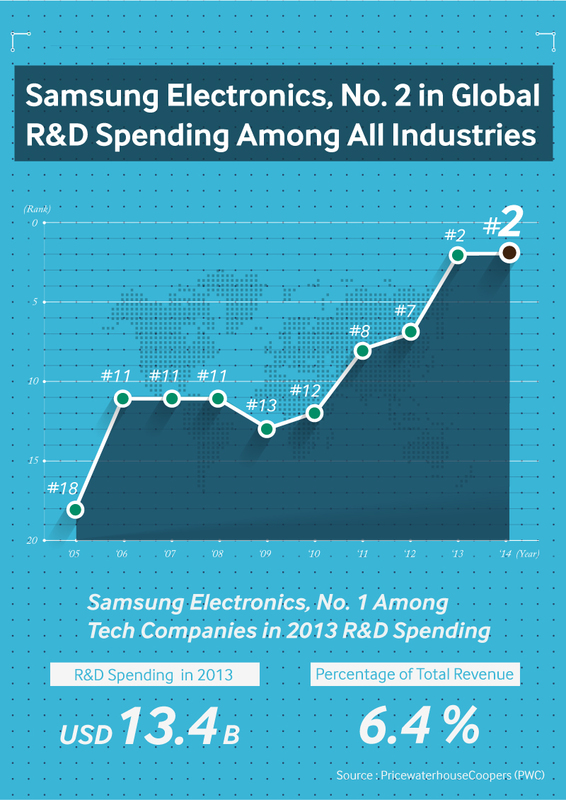 Samsung’s investment in R&D can also be seen in the number of R&D personnel. According to the sustainability report 2014, Samsung has increased its R&D personnel by 27% since 2010, for a total of 63,628 employees. Samsung has actively adopted an open-innovation platform along with an in-house R&D system, while reinforcing overseas R&D centers to further advance the development and utilization of customized technologies to address region-specific needs. Samsung Electronics plans to focus its investments on securing innovative technologies as engines for future growth, as it sees R&D as a way of securing sustainable growth. Big things are coming, and Samsung is certainly leading the way. With this commitment to innovation, the sky is the limit. Stay tuned as things develop.